Project obstacles and solutions: The homeowners wanted to create a new driveway and patio area to surround their house with high-end, decorative concrete. They wanted to incorporate landscape lighting and heating elements throughout the concrete. Architectural Concrete designed a hardscape that incorporated a brown tone Fractured Slate stamp pattern with a broomed gray border. This included push out flower beds and border lighting built into the concrete. IMI supplied 115 yards of colored concrete for this project. There are challenges with this large of a project. Making sure the concrete is producing a surface paste that is consistent with stamping is crucial. So are the coarse aggregates used in the mix. It is important to get good segregation of coarse aggregates when pouring stamped concrete. If the larger aggregates are too close to the surface, they can cause pop outs. The third factor is making sure the concrete is not setting up too quickly so that the stamped impressions can be formed in the concrete late in the plastic state. IMI QC/QA designed a mix that produced a superior paste, used a smaller aggregate and kept the concrete in a plastic state longer to accommodate the stamping process. Another key to this job was consistency in color. Keeping the color consistent when you are dealing with multiple pours is very important. The stamped portion of the project began with a base color mixed integrally with the concrete. A powdered color release was added to the surface of the concrete prior to the stamp being applied. The release darkens depressed areas of the concrete and requires a finisher that understands how the shake on color will interact with the integral color. 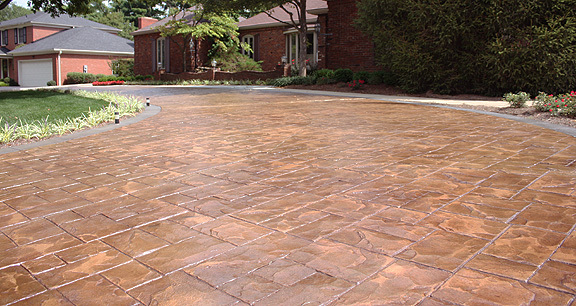 The other very important aspect of colored concrete is using the proper sealers. Knowing when and how to apply sealers will have a long term impact on the color, as well as the quality of the concrete. IMI color representatives advised Architectural Concrete on this job. Sealers have a huge impact on the vibrancy of the color as well as protecting it from corrosive chemicals. However, not every sealer is right for color. In this case, a glossy, transparent cure and seal product with 30% solids was used. It not only gave the concrete a semi-wet look, it enhanced the color–particularly the darker tones of the release–to contrast against the lighter hues of the integral color. For more information on concrete sealers, click here.